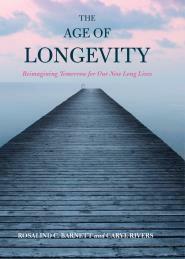 Caryl Rivers Archives - Joelle Delbourgo Associates, Inc.
Long, productive lives are the destiny of most of us, not just the privilege of our great-grandchildren. The story of aging is not one of steady decline and decay; we need a new narrative based on solid research, not scare stories. Today Americans enjoy a new, healthy stage of life, between roughly 65 and 79, during which we are sta ying engaged in the workplace, starting new relationships and careers, remaining creative and becoming entrepreneurs and job creators. 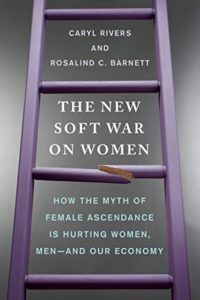 Rosalind C. Barnett, Ph.D, has donepioneering research on workplace issues and family life in America, sponsored by major federal grants. She is senior scientist at the Women’s Studies Research Center at Brandeis University. Rosalind is a 2013 recipient of the Families and Work Institutes’ Work Life Legacy Award. She is the recipient of several national awards including the Radcliffe College Graduate Society’s Distinguished Achievement Medal, the Harvard University Graduate School’s Ann Rowe award for outstanding contribution to women’s education, the American Personnel and Guidance Association’s Annual Award for Outstanding Research, and the Harvard University, Kennedy School of Government’s 1999 Goldsmith Research Award. Alone and with others, she has published over 115 articles, 37 chapters, and ten books. She has directed major research projects for the National Science Foundation, the National Institute of Mental Health, the Alfred P. Sloan Foundation, the U.S. Department of Education, and others. Caryl Rivers is a nationally known author and journalist. She was awarded the Helen Thomas Lifetime Achievement Award in 2007 from the Society of Professional Journalists for distinguished achievement in Journalism. She is a professor of Journalism at Boston University. Professor Rivers received the Gannett Freedom Forum Journalism Grant for research on media, the Goldsmith Research Grant, from the Shorenstein Center at the JFK School of Government, Harvard University, for research on gender and media issues, and the Massachusetts Foundation For The Humanities Media Studies Grant to research the ways in which gender, race and class affect news coverage. When a publisher designs a hardcover jacket, it does so with the best of intentions. It asks: Who is the audience? How do we best position a book for that audience? How do we create an eye-catching design? should the cover be all print or feature an image or several images? If an image is used, should it be photography or art, symbolic or literal? For example, if it is a novel and the heroine is a fiery redhead, does it matter that the “found art” used in the cover design shows her as blonde? What do other similar/competitive books look like? Should this cover mimic the competition, thereby sending a signal that if you liked a certain book, you’ll like this one, or should it deviate and create a fresh look? And these days, a publisher must ask, how will the cover reproduce digitally for those readers who will buy electronic copies vs. print? If a book has multiple lives, releasing first in a hardcover edition and then in paperback, there can be a new discussion. For a bestselling hardcover going into paperback, the publisher will often choose to stick with the original design, since that has worked so well, and add the best of review quotes to the back cover copy. Remember, with a paperback, you no longer have flaps, so all copy, descriptive and otherwise, needs to fit on the back cover, and a particularly laudatory quote or two might appear on the front cover. What’s interesting with a second edition, is that the publisher now has history. The publisher knows if the book sold well, or not so well. Did the intended audience buy the book or did the book actually sell to an unexpected audience? Were reviews good or bad? How have current events that have occurred since the book was first published impact the way the audience might respond to the book. 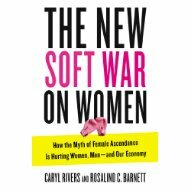 A case in point is THE NEW SOFT WAR ON WOMEN, a collaboration between journalism p rofessor Caryl Rivers and researcher Rosalind C. Barnett. In this instance, Tarcher, a division of Penguin Random House, first opted for a bold cover in with hot pink and black type on a stark white cover. They used bright yellow as a backdrop for the subtitle and a small icon, a pair of pink boxing gloves, as spot art. The book received some attention, thanks in part to the tireless marketing efforts of is author team, with full support from the publisher. But it also may have missed its mark a bit because Sheryl Sandberg’s LEAN IN came out around the same time, dominating the media. So with the paperback, Tarcher went back to the drawing board and came back with a new design that is quite compelling. It features a broken ladder, a great symbol for the central thesis of the book, that the war for women’s rights is far from won, even though there is a perception that it’s an old battle. The ladder dominates the jacket in a way that the pink boxing gloves on the hardcover jacket did not; they were a little hard to make out. Both are effective jackets, but each one is customized for the task and price point of its audience. Second time around, authors should always think like a publisher and ask: What have we learned? Is there something we can do better, or just differently? If your publisher doesn’t bring this discussion up, feel free to initiate it. Paperback reprint is and can be about reinvention.